The case involves a mural painted on a parking structure in Detroit in 2014. The artist, Adrian Falkner (who works under the pseudonym SMASH 137), is a Swiss resident who has exhibited works in museums and galleries around the world. In 2016, the mural was prominently featured in a marketing campaign for a new model of Cadillac, without Falkner’s knowledge or consent. Falkner, like other graffiti artist plaintiffs before him, emphasizes the damage allegedly done to his reputation here; he says that he has been extremely selective about having his work associated with any commercial brand. He also seeks, among other relief, an accounting of how much GM generated from the offending campaign, punitive damages, and injunctive relief to halt further use of the allegedly infringing advertisements. Because Falkner did not apply to register the work until 2018, he cannot seek statutory damages and, should he ultimately prevail in the case, he would eventually need to prove his actual damages—a task which can sometimes prove challenging for artists, especially graffiti artists. As we’ve discussed before, it has been argued (albeit with little support from case law) that graffiti art should not enjoy the protection of copyright law where it is created through illegal vandalism. But that theory would be useless to GM on the facts presented here—the plaintiff alleges that his mural was not illegal, but rather was created by invitation. So here, GM has now put forward a different defense. In a motion filed this summer, GM argues that Falkner’s claims should be rejected due to a statutory provision, 17 U.S.C. § 120(a), which provides that a “copyright in an architectural work that has been constructed does not include the right to prevent the making, distributing, or public display of pictures, paintings, photographs, or other pictorial representations of the work, if the building in which the work is embodied is located in or ordinarily visible from a public place.” This provision limits infringement claims where someone is photographing or painting a work “if the building in which the work is embodied” is in public view. GM argues that, because the mural is incorporated into a building, the mural is “subject to the same pictorial representation exemption as the underlying architectural work.” In response, the plaintiff has argued, among other things, that that interpretation is not supported by the statutory language or by case law, noting that, “if GM’s view prevailed, all graffiti art that exists on a building—that is, most graffiti art—would suddenly be unprotected by copyright.” That’s not quite true; as the defendant explained, “recognizing a copyright in [pictorial] elements [incorporated into] a building is not inconsistent with finding that such copyrights are subject to the pictorial representation exemption.” For example, if the defendant’s argument carries the day, a graffiti copyright owner like Falkner might still be able to sue for copyright infringement if portions of his mural were copied onto a tee shirt; but the mere photographing of the building—and the artwork on it—should not give rise to liability, GM argues. We'll look forward to a forthcoming decision by the court on GM's motion, which is now fully briefed. 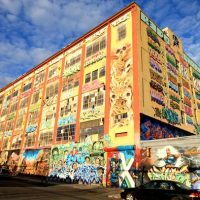 But should GM prevail, such a ruling could change the economic incentives involved in graffiti on buildings, both for the artists and for those who wish to exploit such artworks.